Every culture has its great bread traditions for holidays and celebrations—traditional Christmas loaves from Ukraine, Greece, Germany, Italy and Scandinavia; celebration breads from France and Israel; Easter breads from the United Kingdom, Sweden, and Austria to name a few. The book is chock-full of fragrant, yeasted treats made for celebrations and special occasions. All the old standbys are here, plus delicious examples from around the world. All were too time-consuming and painstaking to make at home—until now. 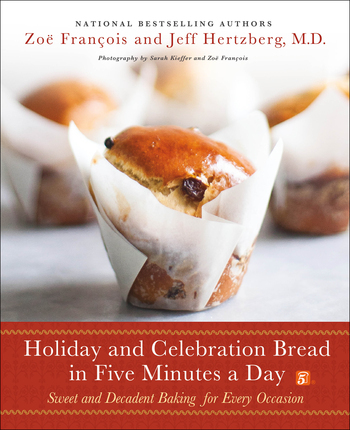 In 100 clear and concise recipes that build on the successful formula of their bestselling series, Holiday and Celebration Bread will adapt their ingenious approach for high-moisture stored dough to a collection of breads from the four corners of the globe. This beautiful cookbook has color photos of every bread and includes step-by-step collages. With Zoë and Jeff’s help, you’ll be creating breads that rival those of the finest bakeries in the world—with just five minutes a day of active preparation time. Zoë François is a pastry chef trained at the Culinary Institute of America. Her love of bread has enticed her to travel, looking for the world’s best loaves. She also creates desserts on her pastry blog ZoeBakes. Jeff Hertzberg, M.D. grew up eating great breads and then traveled the world looking for more. As his medical residency wound down, he started a years-long quest to figure out how to make dough that was convenient enough to use every day.